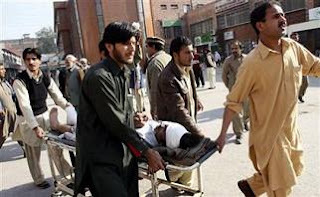 7 died and more than 20 injured in a suicide attack or bomb blast in a bus near kharian district Gujrat. 3 women and 1 child also included in dead people. This tragic incident was happened at about 1935hrs today, in village Chak Kamal, about 14km away from Tehsil Kharian. It was a 72 seater bus while at the time of incident there were about 50 passengers in it. Dead bodies and injured persons are sent to CMH Kharian, Aziz Bhatti Shaheed District Headquarter Hospital Gujrat and Tehsil Headquarter Hospital Kharian. Emergency is declared in hospitals. Rescue 1122, Edhi Ambulances, Police and other law enforcement agencies are active to help injured and to restore peace in region. DCO Gujrat, Nawazish Ali told media that bus was going from Kotla to Kharian and bomb was exploded near Chak Kamal. RPO Gujranwala Ahmed Mubarak Ahmed told media that it was not a suicide attack, it was a bomb blast. This area comes under Guliyana Police Station. Initially it was reported as Suicide Attack but now it is also being said that it might be a bomb blast. yah really this is very bad news !! !